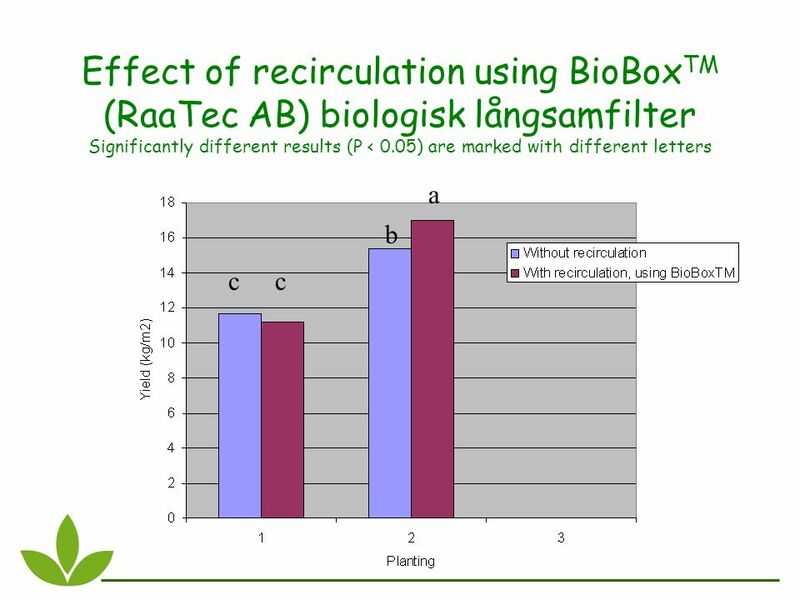 Effect of recirculation using BioBox TM (RaaTec AB) biologisk långsamfilter Materials and methods Cucumber plants were grown organically using a limited. 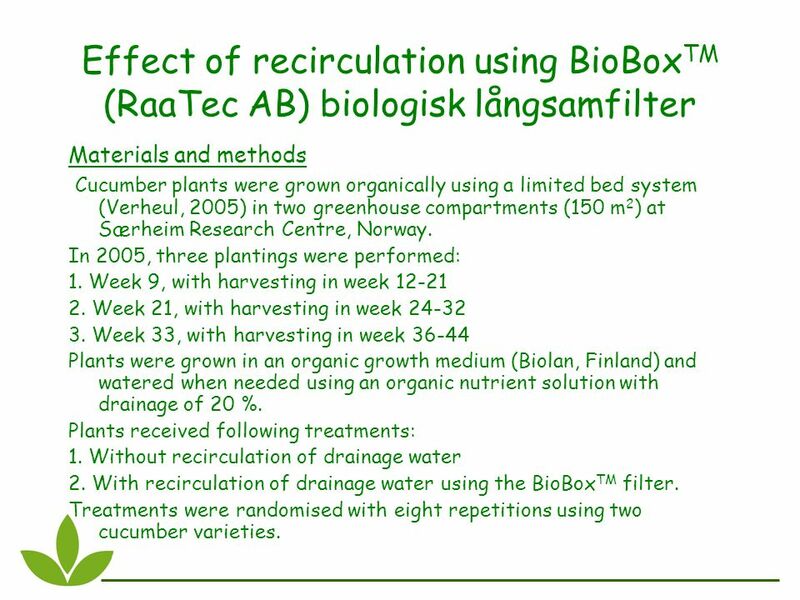 1 Effect of recirculation using BioBox TM (RaaTec AB) biologisk långsamfilter Materials and methods Cucumber plants were grown organically using a limited bed system (Verheul, 2005) in two greenhouse compartments (150 m 2 ) at Særheim Research Centre, Norway. In 2005, three plantings were performed: 1. Week 9, with harvesting in week 12-21 2. Week 21, with harvesting in week 24-32 3. Week 33, with harvesting in week 36-44 Plants were grown in an organic growth medium (Biolan, Finland) and watered when needed using an organic nutrient solution with drainage of 20 %. Plants received following treatments: 1. Without recirculation of drainage water 2. With recirculation of drainage water using the BioBox TM filter. Treatments were randomised with eight repetitions using two cucumber varieties. 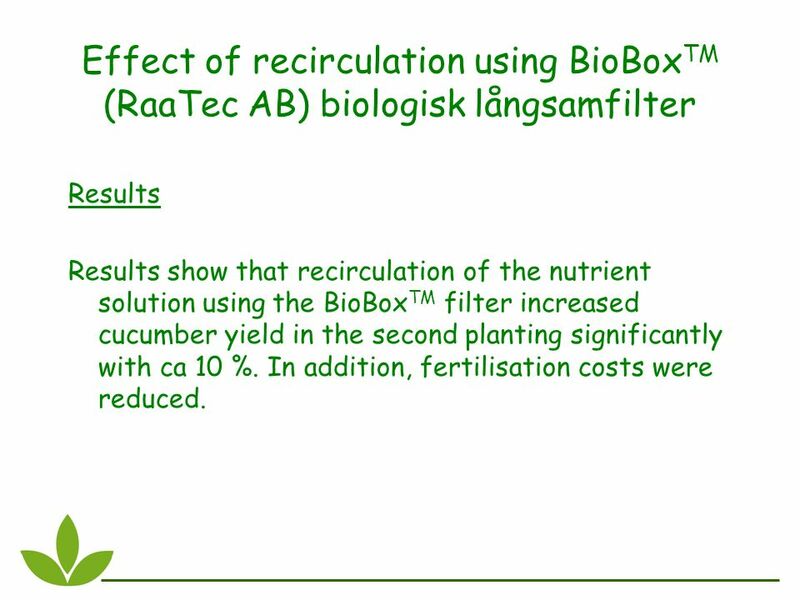 3 Effect of recirculation using BioBox TM (RaaTec AB) biologisk långsamfilter Results Results show that recirculation of the nutrient solution using the BioBox TM filter increased cucumber yield in the second planting significantly with ca 10 %. In addition, fertilisation costs were reduced. Download ppt "Effect of recirculation using BioBox TM (RaaTec AB) biologisk långsamfilter Materials and methods Cucumber plants were grown organically using a limited."